There are many unexpected issues that may threaten the security of our computers, such as system crash, a bad virus infection, inappropriate operations etc. Disk imaging tool has now become a must have tool for the majority of users. With these tools, users can safely recover their computer in most circumstances without having to reformatting and reinstalling the operating system. I would like to recommend you great free Windows backup software – AOMEI Backupper Standard Edition. It is ideal for both the novice and advanced user alike, with a very clean user friendly GUI. The primary backup options are Disk Backup, Partition Backup, System Backup and File and Folder Backup. Here we are talking about its clone features. Disk Clone: Directly copy a hard drive to another without creating an image file. The free program supports to copy large hard disk drive to small solid state drive (HDD to SSD), clone one disk to another without breaking off the running operating system. In default situation, this software just clones the existing data on the disk, if you select the “Sector by sector” option, all the data on the disk, whether it has been deleted or not, will be cloned. With supported to the latest Windows 10, so this free Windows 10 cloning software allows Windows 10 users to clone hard disk to another, even from a larger one to a smaller one. System Clone: system clone means to make an exactly same copy of operating system (OS) as the original one and transfer it to another storage device, like hard disk drive (HDD), solid state drive (SSD), etc. What is worth mentioning is that the cloning/migration copy not only your Windows operating system, but also installed applications and custom settings in the system drive. Nowadays, more and more people upgrade to Window 10, you can transfer Windows 10 from hdd to ssd for faster running speed and better performance with this feature. The Standard edition need to unlock this function, but don’t worry, it’s simple, just share AOMEI Backupper to any of your social network sites such as Facebook, Twitter or Google plus to unlock this feature. Partition/Volume Clone: When cloning a disk, all the partitions will be cloned one by one. For more flexible operations, AOMEI Backupper provides partition clone, which can clone single partition, rather than the whole disk. For example, the D: can be cloned to E: and also D: can be cloned to another hard disk. 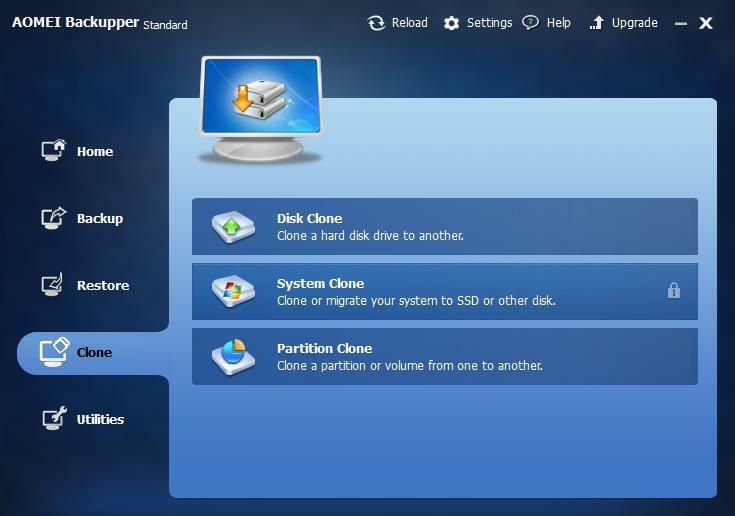 Create an exact duplication of your partition or dynamic disk volume, and exactly clone it to another partition or hard drive. AOMEI Backupper Standard is reliable free cloning software. It enables you to migrate system drive, transfer data, upgrade disk, or replace old small hard drive with new large one. If you are looking for a fast and easy way to perform backup and clone then AOMEI Backupper offers exactly that. It has been upgraded to version 3.2 now, supporting Windows 10, Windows 8.1, Windows 8, Windows 7, Vista, and XP.